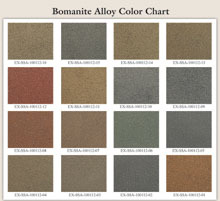 Bomanite Alloy is an architectural exposed concrete with varying exposure depths using non-native quartz and decorative aggregates that are surface seeded on concrete. The Bomanite Alloy System utilizes specialized concrete mix designs, dry shake decorative aggregate hardener and/or integral color, topical treatments and advanced application procedures to produce a finished product that showcases the seeded aggregate. The final product is unique alternate to other decorative concrete finishes while producing a monolithic concrete slab with a low life cycle cost due to the pre-aged nature of the surface. Bomanite Alloy is suited for exterior applications— anywhere that improved wear resistance for light- to moderate-duty vehicular or foot traffic combined with an architectural finish is necessary. Due to the use of Bomanite Color Hardener, these highly durable surfaces are available in a multitude of standard and custom options, including cost effective light-reflective formulations that may not require the use of white cement to reduce heat island effect. Bomanite Alloy is intended for both new construction and major renovation projects. 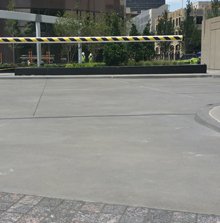 Bomanite Alloy is most commonly installed as full depth slab on grade pours along with un-bonded thick section toppings 3″ or greater in thickness over membrane applications. The specialized design of the dry shake hardener along with placing and finishing are critical to the success of the finished product. Topically applied products such as Bomanite Chemical Stain are compatible with Bomanite Alloy Systems.